Hey all you Brit Nails readers! My name is Kellie and I blog over at www.KellieGonzo.com. 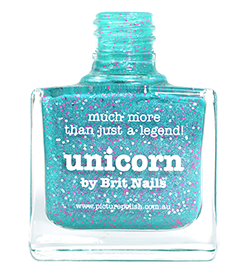 I've been a nail polish blogger for almost seven years now, I just can't get enough of it! Part of the fun is getting to know so many amazing people all over the world. I live in rural Nevada in the US and how cool is it that I get to know an awesome chick like Allie who is all the way overseas in the UK! Pretty great! I'm really pleased to be sharing some polish with you today, these two shades are from Australian based indie brand Powder Perfect and are part of their boutique line. Rainy Days Call For Greige is "inspired by those beautiful rainy days where you are snuggled up at home under the covers, hot chocolate in hand, with a great movie playing." A lovely crème shade in between grey & beige, a fabulous neutral. The formula is thin but easy to apply. This is three coats. Dries very shiny! Principessa was inspired Powder Perfect creator Jacinta's childhood "with 2 rambunctious sisters who loved dressing up our puppy & dolls and nicknaming them Principessa".This is a sweet feminine mid-toned pink with delicate multi-coloured shimmer. Applies like butter and was opaque in just two coats. The shimmer is subtle but definitely there. These two shades are available now on the Powder Perfect websites, both the Australian and US based sites. 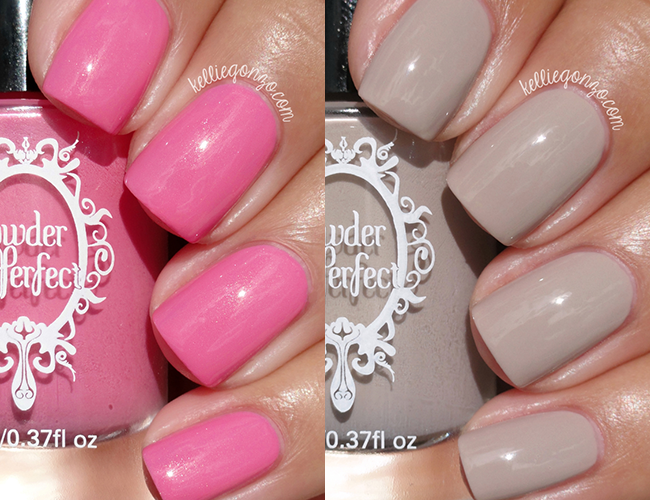 What do you think of these two pretty polishes? Have you ever tried Powder Perfect before? I'm so glad to have shared these with you all today! Thanks again Allie! Thanks so much Allie, I had a blast! These two are truly beautiful. Principessa looks great on you and you captured the subtle shimmer so well. I am glad you liked them as much as I did Kellie. Beautiful swatches, Kellie! Every time I see this set, I squeal. I love the combo of greige and pink! Your swatches are absolutely flawless! They both look gorgeous Kellie! Kellie, your swatches are always my fave! =) And I do love Powder Perfect cremes, they really do them quite well. Your swatches are just perfection Kellie! I adore the shimmer in that pink SO MUCH!